The Bloody Mary cocktail consists of tomato juice, Worcestershire sauce, vodka, your desired level of spice, and an accoutrement of edible garnish, from celery to beef jerky. National Bloody Mary day is January 1st, aka the day many people are hungover. Touted as a hangover cure, the bloody mary is a popular brunch cocktail. Some bloody mary enthusiasts prefer to have their bloody mary for them, while other bloody mary fans are on the hunt for the best build your own bloody mary bar in town. What makes a build your own bloody mary bar good, anyway? Toppings. Unlimited blocks of cheese, exotic pickles, did we mention bacon? These Chicago bars have a bloody mary spread you’ll be drooling over. Parlor has multiple locations in the city, and a DIY bloody mary bar to compliment your pizza. Bub City in River North is a country western bar serving barbecue and a build your own bloody mary bar on weekends. Rockit in River North is also an option for building your own brunch cocktail. Most of the build your own bloody mary bars above will probably make one for you if you’re too lazy to leve the table. If you prefer to sit tight and have your bloody mary delivered to you from laziness or because you appreciate good craftsmanship, these bars make a mean bloody mary. Sunda in River North piles on the toppings to its bloody mary. Similarly, Homeslice in Lincoln Park skewers a slice of pizza into the bloody mary garnish stack to ensure you are satiated. Twisted Spoke in West Town is known as a biker bar and whiskey lover’s destination. At Twisted Spoke brunch, you can expect a solid food menu with a variety of bloody mary concoctions that you can add a beer back or shot of whiskey to. Smoke Daddy doesn’t disappoint with its bloody mary toppings, as each one comes with plenty of meat. Eleven City Diner piles a generous amount of cheese and salami onto its famous bloody mary, and has a decadent brunch menu to soak it up with. Beatrix has a green bloody mary which is a unique spin on a traditional brunch cocktail. 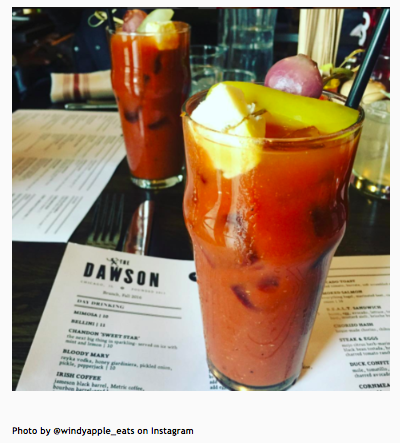 Flo in West Town is also a great place to try a green bloody mary in Chicago.